The juicy Almo Nature ClaΒic Jelly Pouches contain a high quantity of rich stock, designed to encourage your cat to take on sufficient fluids. The recipe contains up to 51% fresh meat and fish chunks of human grade quality and, thanks to the gentle cooking method, offers a range of natural micronutrients to help your cat meet its nutritional needs in a species-appropriate way. This food is also free from artificial preservatives or other additives. The practical pouches guarantee freshneΒ and flavour, as well as allowing you to portion food out in a clean and simple way. The jelly in these pouches is made from vegetable substances and helps to move swallowed hairs through the system, preventing the build up of hairballs. Almo Nature ClaΒic Jelly Pouches also help to clean your cat's stomach in a natural way. As with all Almo Nature ClaΒic varieties, this food is grain- and gluten-free, making it suitable even for sensitive cats. A delicious, natural food for the fuΒiest feline connoiΒeur! Almo Nature ClaΒic Pouches 6 x 55g at a glance: Supplementary food for cats of all ages Available in a range of flavour varieties With fresh meat and fish: with up to 50% finest quality fresh meat or fish of human grade quality Rich in moisture: with lots of natural stock to encourage intake of fluids Natural: gently prepared to make it tasty and digestible Natural protection against hairballs: the jelly helps clean the stomach and move swallowed hairs through the system High nutritional profile: gently prepared to preserve proteins and micronutrients Gluten- and grain-free: also suitable for sensitive cats In practical pouches: for easy, clean portioning and the protection of flavour and freshneΒ Light, delicious formula: a species-appropriate recipe that does not overload your cat with unneceΒary calories Free from artificial additives The 3 Chicken Varieties Multipack contains: 2 x Chicken Fillet 2 x Chicken and Whitebait 2 x Chicken and Shrimp The 3 Tuna in Jelly Varieties Multipack contains: 2 x Tuna and Sole 2 x Tuna 2 x Tuna and Whitebait Please note: Almo Nature cat food is entirely natural. 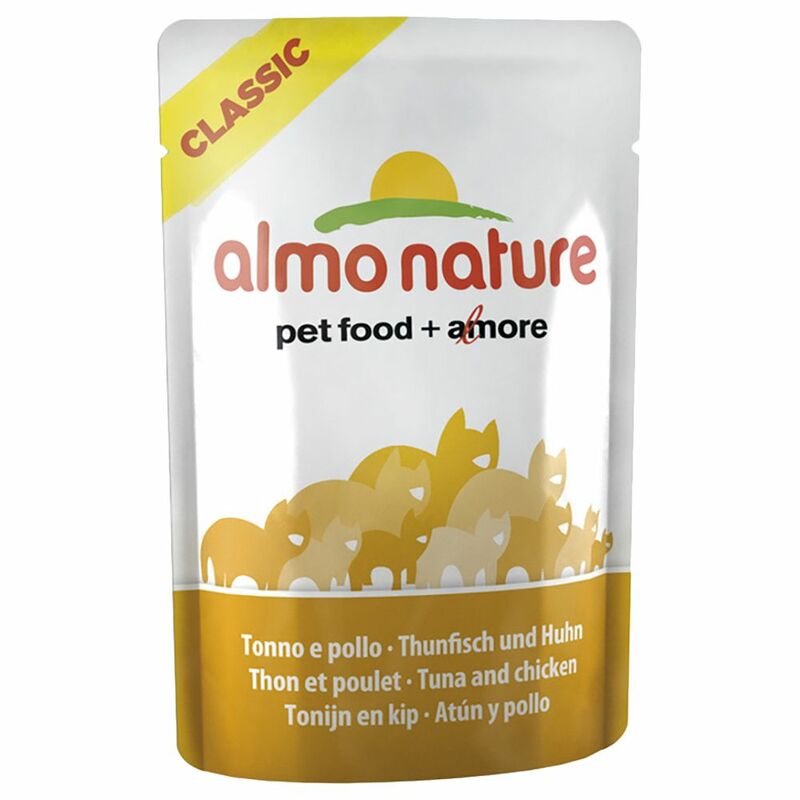 Every single flavour of Almo Nature wet food (tuna, chicken etc) contains its own proportions of vitamins, minerals (e.g. calcium, phosphorus) and taurine. Almo Nature therefore recommends a diet which is based on a variety of different natural foods (red meat, poultry, fish, dry and wet food). The varying nutrient contents of this variety will ensure a balanced diet for your cat. Almo Nature ClaΒic is a supplementary cat food.